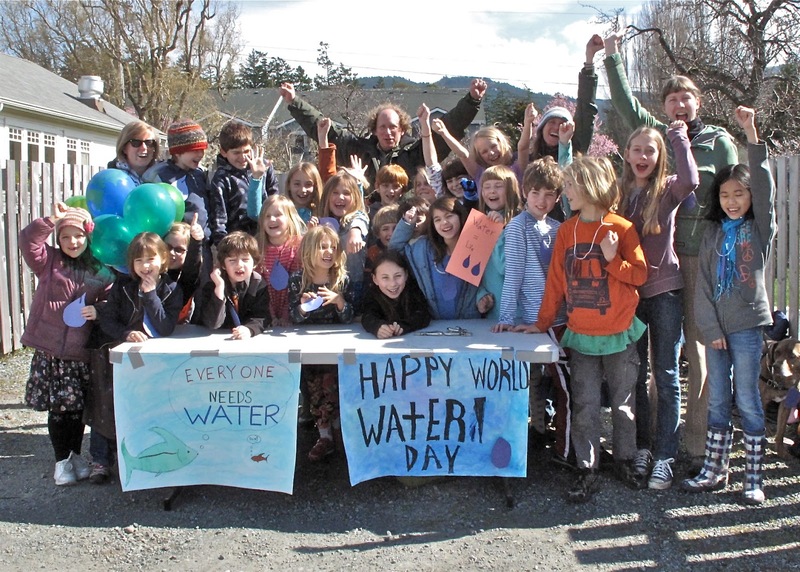 Orcas Island, Washington State, March 23 - Salmonberry School students celebrated World Water Day with a walk for water through the village of Eastsound. Preceding this walk-a-thon event students secured pledges from friends and family and then set out to walk to raise awareness of water resource issues around the world and to raise funds to drill wells in a draught stricken region of Niger, called The Azawak. In this poorest region of the poorest country on Earth in some seasons children have to walk up to 35 miles to get access to fresh drinking water. This was Salmonberry School's second Walk for Water, and each time has been such a transformative learning experience for the kids, parents and teachers. At a time when coming into consciousness about the world can be so depressing and can easily lead young people towards despair, hopelessness and guilt, projects like these provide the antidote. Rather than deceiving kids into believing mythology and rhetoric about peace, justice and equality, I believe it is critical, with great sensitivity to developmental readiness, to expose kids to truths about the injustices of the world. But then we must simultaneously provide real opportunities for the kids to "be the change" and work towards a positive world vision. 26 Salmonberry School students ended up raising approximately $2,500 for Amman-Imman. They felt such pride in this accomplishment and in knowing that they were making a difference for people in the Azawak. It is an honor to work with this organization. My most sincere thanks to all who are involved in this important work and especially to those educators who bring this opportunity to their students.